Winter is a romantic, magical season for a wedding! Perhaps the winter months may not seem ideal for a wedding but if you haven’t set the date yet for your big day, don’t rule out December, January, and February. Even if you always dreamed of having a sunny summer wedding, read our tips on How to Save on Your Perfect Winter Wedding below. These tips might just convince you that the winter season is actually the ideal time of year to say your vows. Are you a bride on a budget? You’re in luck because a white winter wedding can save you lots of green. Since the winter months tend to be slower for wedding vendors, many of them offer discounts or are willing to negotiate prices. Once you add up all your savings on a DJ, florist, bakery, etc. you can then either pocket those savings, or re-invest them into other wedding items, like decor, apparel, and accessories. 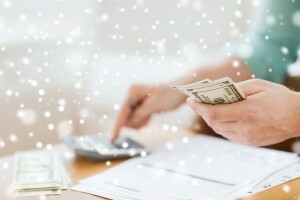 Spend less, get more…another win-win for the winter bride! Do you have your heart set on a particular reception hall or photographer? You might be in luck because winter weddings are far less common, which means you’ll probably be able to snag that popular venue or wedding vendor that you’ve been dreaming of. And since their schedule is likely to be pretty open, you won’t have to settle for a less-than-ideal wedding date. Winter has so many themes and motifs that you can weave into your wedding day. To stay cozy and warm, you can drape yourself in elegant cover-ups and accessories. Stay fashionably warm with some hand warmers or accessorize you and your bridesmaids’ dresses with a chic shrug, or wrap. Because winter weddings are far less common, simply having your wedding in the winter will make it very unique and memorable. You and your wedding guests attend so many weddings throughout your lives, so having a winter wedding will be something fun and different for everyone involved. Although having a winter wedding can save you a lot of cash that doesn’t mean that you want it to be cheap– after all, it’s you and your partner’s big day! Get a head start on planning your dream wedding by looking into personal loans online today to help you and your loved one get everything you need to make your day the best day of your lives. At Tio Rico Te Ayuda, we offer personal loans of up to $1,000 with loan approval in 30 minutes or less, even if your credit is less than perfect. Contact us today to learn more!